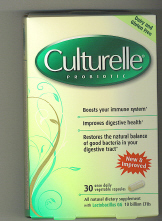 Culturelle is the Number 1 pharmacist-recommended probiotic. Culturelle's Lactobacillus GG is one of the most effective strains of good intestinal bacteria (or probiotic) for helping to correct the causes of gas, bloating and stomach upset. Culturelle also contains Inulin from Chicory root extact. Inulin feeds the lactobacillus normal gut organisms helping them to recolonize the gastrointestinal tract to provide for healthier digestive functioning. Antibiotics, acid blockers, poor diet, excess coffee, tea, alcohol & meat contribute to decreased intestinal flora. Antibiotics kill off helpful organisms, leaving the digestive system without defense to staph, yeast, & other infectious agents. * This may cause an antibiotic induced diarrhea. Culturelle has been shown to be helpful in controlling this diarrhea and rebalancing intestinal flora, even with C.Difficile a difficult gut pathogen which can occur with antibiotic use. Stimulates the immune system to support overall health and wellness. Helps promote regularity and bowel function. Helps manage bloating and discomfort. Can help shorten the duration of occasional diarrhea. Is safe to be taken with medications, including antibiotics. Survives stomach acid and intestinal bile, unlike many other probiotic strains. Adheres to and colonizes the intestinal tract. Provides a minimum of 10 billion live cells at time of usage, the amount most often recommended in medical research. Made under controlled climate conditions to maximize potency and shelf life. Packaged in tamper evident, double strength foil to protect against light, moisture, air and heat. DIRECTIONS: Take 1 capsule daily for basic prevention and maintainance. With antibiotic use and for 1 month after antibiotics use 1 twice daily with meals. With a diagnosis of candida (chronic yeast overgrowth) stay on maintainance of 1 twice daily with meals. For Traveling: Take 1 capsule twice daily throughout trip. Best if started 2 to 3 days prior to travel. Safe and effective for infants and children: Give 1 capsule daily. Open capsule and stir contents into cool drink or mix into baby food or applesauce. Do not store above room temperature. May be stored in the refrigerator. Refrigeration NOT required, but will ensure maximum potency and shelf life. Other Ingredients: Natural vegetable based capsule Grown on whey and will contain trace levels (less than 15 parts per million per capsule)of casein and whey, which are proteins found in milk. Free of artificial dyes, colors, preservatives, flavors, yeast, wheat, gluten, lactose or corn. **Guaranteed minimum through "Best Used By" date when stored at room temperature.